It’s a pretty interesting life as a photographer. Life has a way of testing your skills and your clients look to you to pluck a masterpiece out of extreme lighting conditions. 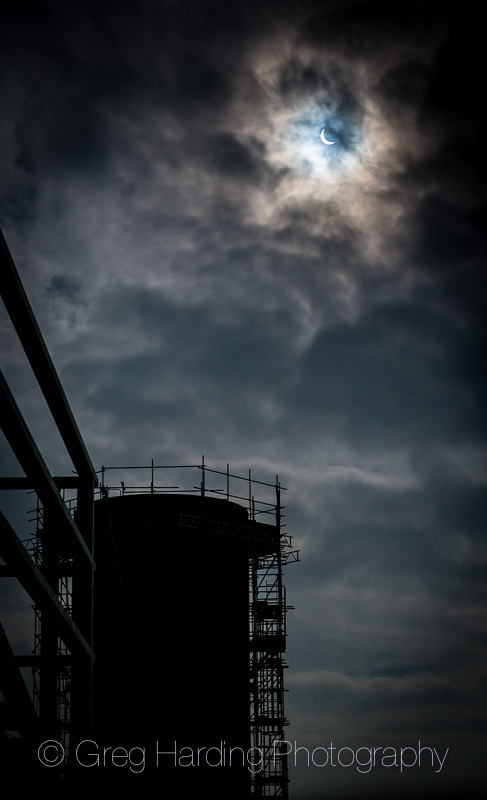 The recent solar eclipse took place when I was out on a construction site in Manchester. Of course I knew it was going to happen and had packed a variable neural density to watch it. I hadn’t actually planned to be photographing at that particular time. I’d planned a shoot involving an elevated platform and some cooling tower fans later on that morning. However the opportunity presented itself and I thought whilst the eclipse was taking part, I’d try to get some images of the solar event in context with elements of the surrounding construction site. There’s some part-erected stacks that I thought could silhouette nicely against. The composition proved challenging and the lighting conditions even more so especially with the event being obscured by a large cloud cover. 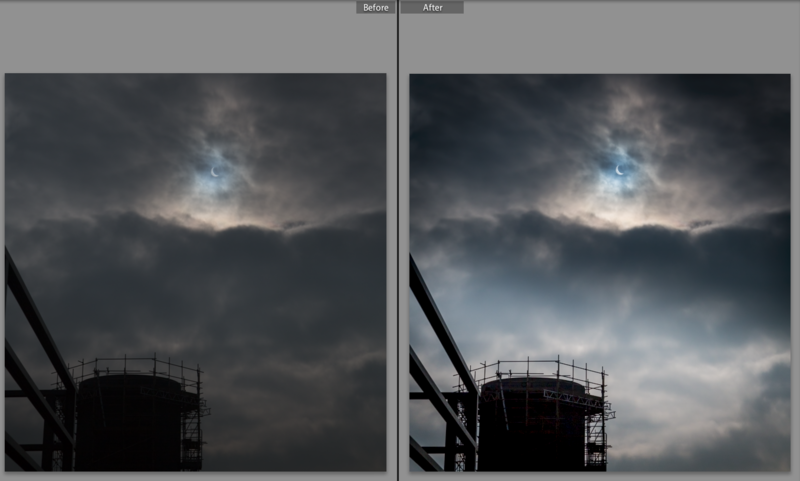 Trying to marry the intense brightness of the sun with the surroundings of a dark construction site was always going to be nigh on impossible, but I thought with a little post-processing I could handle the extreme exposure latitude. I loaded the lens up with a vario-neutral density filter and dialled the exposure in. Warning: under no circumstances should look at the sun without some heavy filtration across the lens. I use RAW format to capture all my shots with, I knew that I could exposure to hold the highlights of the eclipse and then pull the shadow detail back in post, I’ve done this a few times with great success but this was at the extreme end of the technologies capabilities (fingers crossed). If you tried this technique shooting with JPEG you’d be really disappointed, the images are really flat with such small detail beyond the correct exposure. The ability to pull detail from the highlights and shadows in post is THE reason I shoot in RAW format. Even shooting RAW, I bracketed my exposures with a significant overlap of 3 stops under and over. Eventually I chose images that had a tiny blow out of highlight. I knew I could recover this loss and hopefully be able to recover the shadow area. I wanted to use just one file. 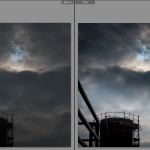 I’m not a big fan of stacking the exposures to make a HDR, these don’t sit well for my eyes. The picture was never going to be flawless, under-exposing an image to hold such a bright highlight was always going to encourage noise in the shadow areas (most of the image). I kept in mind, that this image was all about the rare opportunity to feature the celestial event within the context of a power station construction site. I had to grab it, whatever turned out. Here’s a few before and after processing screen grabs so you can appreciate the amount of under-exposure we’re talking about. 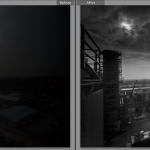 Processing through Lightroom 5. I’d love to hear how you go about holding foreground exposures together without resulting to HDR. Feel free to drop me a line in the comments below. Thanks for reading and share if you care.